After the festive season of eating all that rich Christmas food, I began to crave local flavours and I decided to cook Chicken Rendang (Rendang Ayam). 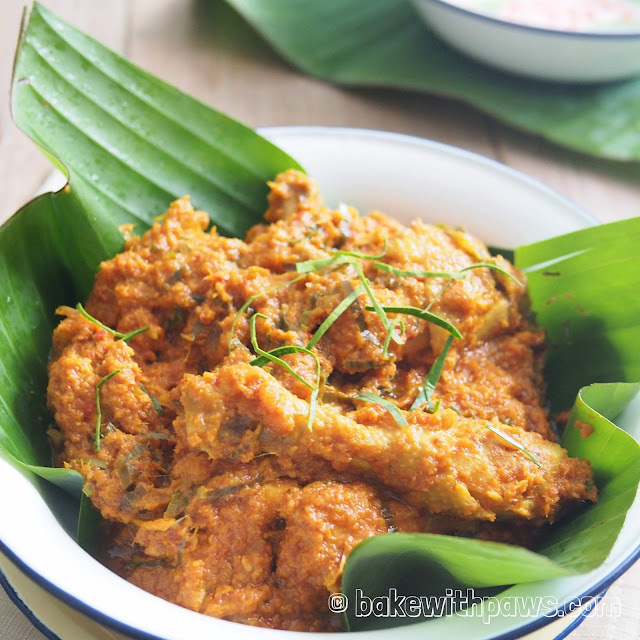 Chicken Rendang is a version of dry chicken curry dish with toasted grated coconut added. I cooked it to go together with Nasi Lemak for dinner ...and it doesn’t get much more Malaysian than that! Blend the spice paste ingredients in a food processor until smooth with a little water added. Transfer the paste into a bowl and add in ground cumin and fennel. Heat the oil in a wok over medium heat, add crushed lemongrass and saute until fragrant. Then in the spice paste and stir fry until aromatic and oil begins to separate. Add in the chicken and stir until all well coated. Then add in the coconut milk. Simmer on low heat for 15 – 20 minutes or until the gravy is thickening. Stir occasionally to prevent the prevent from burning at the bottom and add some water if necessary. Add in kerisik and also all the turmeric leaves and kaffir lime leaves. Season with salt and sugar to taste. Continue to cook for another few minutes. Dish out and serve with steamed rice.